As we all know, cute cartoon characters have always been liked by adults and children, especially in recent years, a large number of cartoon characters who are loved by everyone are emerging. For example, Walt Disney’s Mickey Mouse, Japan’s Doraemon, France’s Garfield, and the US Peanut Manga’s Miguel Beagle Snoopy, and the small Pep Pig in the world. Pig Pecs is deeply loved by everyone, and it has helped generations of people to establish integrity, courage, kindness and fearless spirit in their childhood, leaving a beautiful childhood memories for generation after generation. Seeing here, would you also want to bring such a cute little cartoon character with you? So, how can we bring such a cute little cartoon character to the side, and it must be fashionable and beautiful. I believe that everyone is thinking about it. It doesn’t matter, our GS-JJ.com custom patches website has solved this problem perfectly. At present, GS-JJ.com custom patches website has launched a new topic, which is our cute cartoon. The character plate is a unique design concept and exquisite technology to combine cartoon characters with custom embroidered patches to form a custom patches of cartoon characters that are now very popular. It can be matched with any place you want to match. It is really stylish and beautiful, what a great design. Please follow me in the following steps. 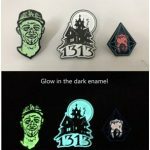 I will select several custom embroidered patches for cartoon characters launched on the GS-JJ.con custom patches website, so that you can get a more comprehensive understanding of this new patch and GS- The uniqueness of this custom patches for GS-JJ.com. 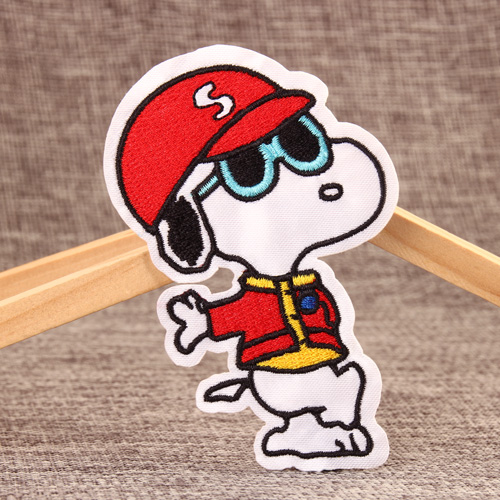 First of all, I saw this cool Snoopy patches from the GS-JJ.com custom patches.I don’t think anyone would like it. Snoopy is an extroverted beagle. He is an art connoisseur, at least when he is daydreaming in his nest. He cares about his owner, Charlie Brown, because this “head boy” will bring him a delicious dinner. Snoopy is very brave and never shrinks when faced with difficulties. The cute and brave image makes SNOOPY a well-known comic cartoon character in the world, and Snoopy SNOOPY’s series of products involve clothing, toys, stationery, bags.Of course,there are also many more beautiful Snoopy patches on the GS-JJ.com. Look! What a lovely Chinese giant panda is eating bamboo there. Its chubby face is really a love. The round head, the black and white fluff, the embarrassing look. How much I want to hold it! At the same time, it shows a little gentleman’s grace. Do you want to ask this gentleman if it wants to invite you? Eat and play? Panda is China’s national treasure, symbolizing China, it is a very gentle animal, with the meaning of peace and unity. The most important thing is that it can bring the friendly relations between countries closer and promote common development. 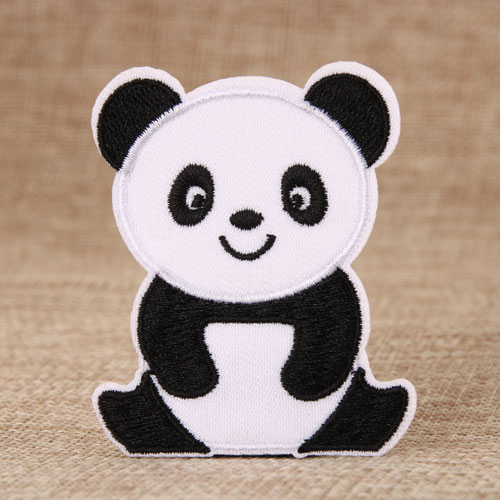 Such a cute little panda badge patches, if you wear it, can become an ambassador to promote friendly relations between countries. Donald Duck is one of the classic animated characters created by Disney. It has orange mouth, feet and shackles, and is wearing a Fonte Roy sailor. Its character is sometimes violent, especially when it is frustrating, but it is easy to give up most of the time. In fact, compared with the image of Mickey Mouse, which is diligent, open-minded, and never fails, it seems that the troubles are repeated, and the Donald Duck who has repeatedly defeated and defeated can better reflect the human nature in reality. Everyone can From the Donald Duck, I found that I have once stumbled, and I will make the same mistakes. Every one of us will have the same time as the Donald Duck. Of course, everyone expects to be as ambitious as Donald Duck. The courage and tenacity of being overwhelmed. 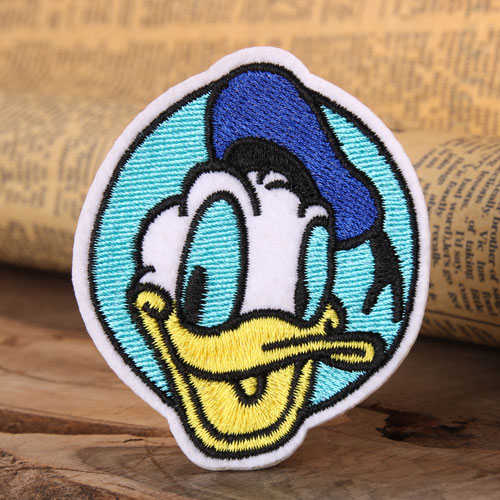 Donald Duck custom embroidered patches will bring you the energy of life and inspire you to succeed. So, come to our GS-JJ.com custom patches, put on our Donald Duck patches, take our male heart, take the courage and tenacity of the more frustrating! The last one was launched with our cute Peppa Pig custom patches. 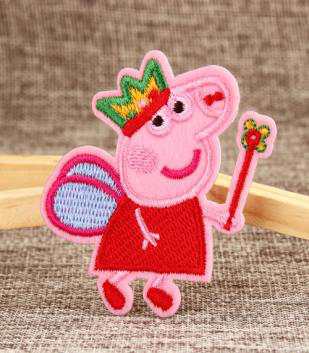 Peppa Pig Embroidered Patches is from a British preschool TV anime “Little Pig Page”. The story revolves around the joyful experience of living with her family, full of humor and fun, and promotes traditional family values and friendships to encourage children to experience life. The minimalist animated style of Peppa Pig and the humorous dialogue and tone are loved by children all over the world and their parents. Our designers use this as a source of creativity. Peppa Pig Embroidered Patches is more lovely in our lives. You can sew it on your hat, T-shirt, jacket and backpack, GS-JJ.com Defining a thorn custom embroidered patch will definitely make you look unique, and there are more Piggy Page custom patches available for purchase. Ok, watching so many cute cartoon characters, you must be very excited, think about our cute cartoon characters to take home. The above shows just some of our simple examples and introductions, which can help you choose the cartoon custom patches you want, I hope it can help you. In addition, our company not only has such a variety of cute cartoon character custom patches, our company website GS-JJ.com has more custom patches with more different styles, such as: A variety of personalized patches, as well as sports-type embroidered patches, motorcycles patches, military patches, morale patches and so on. If you have any questions or interests about our custom patches, please feel free to contact us by phone. Because we have a professional design team, we hope that our company can help you design a perfect embroidered patches for yourself. Welcome to GS-JJ.com to customize the Custom Patches for understanding and purchase. 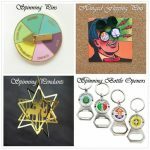 ← As Long As the Design is Good, Accessories Can Also Be Souvenirs and Gifts!